Dolibarr is a combined ERP and CRM software created primarily for small businesses, foundations, and freelance professionals, enabling them to manage and organize multiple aspects of their business like inventory management, contacts, invoice management, orders, communications, and more. It is an open-source platform, allowing users to freely modify Dolibarr to suit their needs and meet their requirements. Dolibarr is built on simplicity, right from installation to usage to custom development. With its design, users can start with features they need and then add more features on a WAMP, MAMP or LAMP server (Apache, Mysql, PHP for all Operating Systems) as their business grows and their needs change. 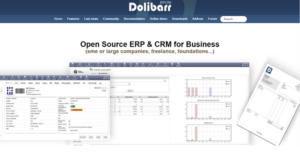 Dolibarr is a rich open-source ERP and CRM software that is perfect for small and medium businesses, small organizations, and freelancers that are looking for a simple ERP/CRM solution that they can configure and customize to bring in the features they need and none that they don’t. It matches your business management need, whether its sales, customer engagement, customer support, invoicing, accounting, inventory management, and more. Even if you are using other systems and software, Dolibarr is ready to integrate right off the bat, allowing you to perform all your critical business tasks smoothly even without the customization. It is designed to be simple to install, implement, and modify, which is why many businesses and organizations are using Dolibarr as their integrated ERP and CRM platform of choice. Being an open-source software, Dolibarr is developed constantly by thousands of developers, testers, and translators who base their development efforts on feedback from thousands of Dolibarr users. This means every new feature or functionality introduced into the Dolibarr software is built on the needs of its end users – YOU. That said, the biggest benefit Dolibarr brings to the table is that it is a free software. You never have to worry about Dolibarr creating a huge dent in your budget. You save so much on costs while enjoying Dolibarr’s huge and exceptional value to your business. Each enterprise has different needs and requires a system that can be personalized for their size, type of employees and customers, and the particular industry they are in. For these reasons, no system can offer perfect functionality out-of-the-box. When you look for a software product, first be sure what you require it for. Read some Dolibarr reviews and ask yourself do you desire basic tools or do you require complex tools? Are there any industry-specific functionalities that you are seeking? Obtain the answers to these questions to help your search. There are lots of factors that you need to reflect on and these include your budget, particular business wants, your organization size, integration needs etc. Take your time, check out a few free trials, and finally choose the platform that offers all that you want to enhance your company effectiveness and productivity. How Much Does Dolibarr Cost? Contact Dolibarr for information on their basic and enterprise pricing options. A free version is available for you to use and see if the software is a perfect fit for your business. We realize that when you make a decision to buy ERP Software it’s important not only to see how experts evaluate it in their reviews, but also to find out if the real people and companies that buy it are actually satisfied with the product. That’s why we’ve created our behavior-based Customer Satisfaction Algorithm™ that gathers customer reviews, comments and Dolibarr reviews across a wide range of social media sites. The data is then presented in an easy to digest form showing how many people had positive and negative experience with Dolibarr. With that information at hand you should be equipped to make an informed buying decision that you won’t regret. What are Dolibarr pricing details? What integrations are available for Dolibarr? If you need more information about Dolibarr or you simply have a question let us know what you need and we’ll forward your request directly to the vendor.